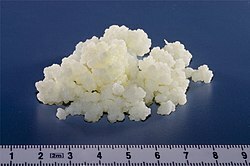 Looking like a kind of rubbery cauliflower, kefir ‘grains’ are a never-ending source of healthy probiotics for our digestive system. Unlike commercial live cultures, they contain no added sugar or flavourings (unless you put them in) and will colonise your gut to provide an aid to digestion, keep a healthy balance of gut flora, and provide you with added nutrients. 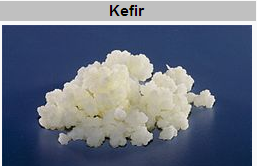 Originating many hundreds, if not thousands of years ago in the Caucasus Mountains, Kefir is a symbiotic relationship between about 30 different bacteria and fungi. Used to preserve milk before refrigeration etc, they ferment the milk and thereby convert milk sugars (lactose) to lactic and other acids. 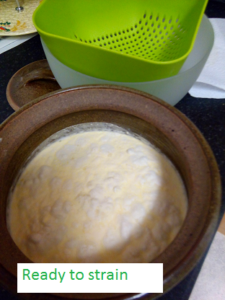 Depending on the ratio of culture to milk, and the length of time it is left to ferment, milder or stronger tasting kefir is obtained. I first obtained about a teaspoonful of minute grains 5 years ago and it has been growing and thriving ever since. I have given loads away (every time you renew the milk the grains multiply also). Since then I haven’t needed to buy yoghurt, sour cream and hardly any cream. It can even be strained (or take advantage of the natural separation) and used like cream cheese. 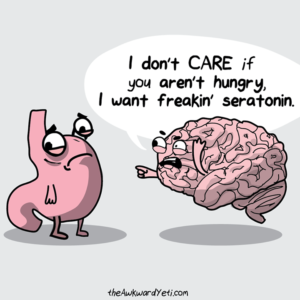 Kefir is a source of tryptophan which the body uses to make seratonin. It also increases other available nutrients (details in the links below). It’s virtually indestructible; lives happily at room temperature and hibernates in the fridge if I go on holiday or don’t need any more for a while. The strained kefir tastes even better if left to mature for a further 24 hours or so.